Hi there – I’m Jill from the blog Homemade by Jill, and I’m so happy to be posting here today. Congratulations to Kirstin on the beautiful new addition to her family. Piper Jane is just lovely! Way back in June, Kirstin and I decided to do a maternity blog swap – she would post for me shortly after my baby Ruby was born in July, and I would post for her in August. So here I am … and although it is a huge challenge to find time to sew, I am so glad I had this commitment. It really got me excited about sewing again! This tutorial is in response to Kirstin’s lament that there are not enough options when it comes to newborn clothing bottoms (pants, skirts, etc.). Since she liked my maternity pencil skirt tutorial, I thought I’d modify it for baby wear – maybe it will be Piper’s favorite as well! *The measurements in this tutorial make a skirt to fit my 13 lb. baby – approximately 3-6 month size. It can easily be modified for smaller or larger sizes. Cut two pieces of denim, 6 1/2 inches x 13 1/2 inches. 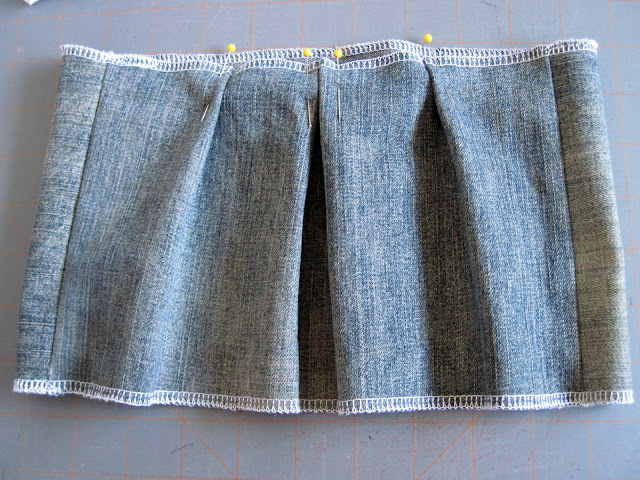 If you do not have a serger and will need to double fold the hem of the skirt, you may want to add additional length. With right sides facing together, sew down the short sides with a 1/4 inch seam, creating a wide tube. I also serged my seams. Turn right side out and press your seam. I chose to serge the top and bottom of the tube at this point (optional). Cut two pieces of stretchy t-shirt fabric, 5 inches x 7 inches (make sure it stretches across the width). With right sides facing together, sew down the short sides with a 1/4 inch seam. Fold the tube down on itself, so the seams are inclosed. The top edge should be folded and the bottom will be the unfinished edges. This is the skirt’s waistband. To gather the skirt I created a centered box pleat with a single pleat to each side. Each of the pleats were about 1/2 inch wide, and the side pleats were approximately two inches off the center pleat. Pin the pleats in place and sew a 1/4 inch seam across the top to secure. You could also gather the fabric using a ruffling technique. Either way, you want the gathered panel to measure approximately 9 inches across. Repeat on the back side. Place your denim skirt inside the knit tube, lining up the waist of the skirt with the cut edges of the tube. You will have three layers of fabric here. Pin in place on the sides, the front middle and back middle (4 pins total). The knit tube will be smaller than the waist of the skirt, but you will stretch it as you sew. Using a zig zag stitch, sew around the entire waistband, stretching the knit tube to fit as you go. Double stitch for extra strength. I also finished off this seam on my serger. Press your seams, and you’re done! Find your cutest tiny model, and enjoy the fruits of your labor. Kirstin, I hope this helps with your clothing dilemma. Congratulations again! That is seriously so darling. I have a bunch of old jeans I was just about to get rid of too. This is AWESOME. I have these large pieces of designer denim I kept from when I had a pair of pants altered (it's a long story) and haven't known what to do with them… TILL NOW! I have been saving a pair of hubby's worn out jeans and a pair of khakis I'll have to try this on. I knew I hung onto them for a reason :). Wonderful! And so timely – I wasn't finding much out there in the stores while assembling my 7 month old's fall/winter wardrobe. It will look great with all the legwarmers that I've been making! I just finished my skirt for my little baby girl due in November, it turned out so cute!! I think her big sister may need a matching one too. Thanks for the wonderful tutorial, I had so much fun making it and putting daddy's old jeans to some good use! I love this! 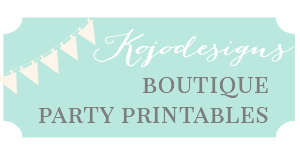 I'm always looking for creative yet time-saving techniques for customizing items for baby showers. This is fabulous and super-cute! Thanks for sharing! If my daughter's waist measures 18 inches how wide do you think I should make the rectangle? Maybe add an inch to each side? What do you mama's think? Girls! I'm following you and I love your blog! Congratulations! A really fantastic and very easy to follow tutorial. I made one for my daughter. Super duper cute! Love it! Even I could make that. Thank you, ladies, for sharing it. This is so freakin’ cute! I knew there was a good reason why I kept my husband’s old jeans. I can’t even believe how much your little girl looks like mine. They could be twins, seriously. Does her hair make a little mohawk in the back, too?